This year the community took back the streets. 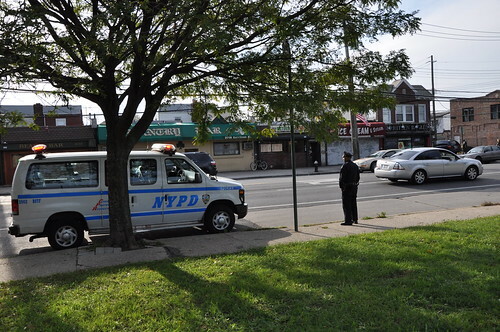 Starting very early on, the police had a strong presence on Gerritsen Avenue. 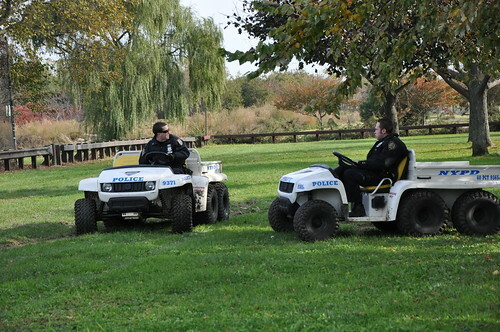 They were patrolling the Avenue and the courts frequently. They also had foot posts with a patrol car at every intersection of a one mile stretch of road. During the prime trick or treating hours (4-8pm) there may have been up to 20 police vehicles and at least that many officers. 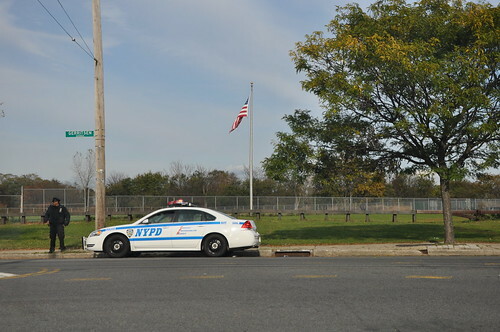 The officers were from not just the 61 precinct, officers were brought in from the 63, Patrol Boro Brooklyn South, and Brooklyn South Task Force. Although last years events were full of drama it seems that this year has been a drastic improvement and was a complete success thanks to the Police, Property Owners, Councilman Fidler’s Office for standing up for us and State Senator Golden’s office for arranging essential meetings. I was extremely pleased to see such a strong Police presence. Thank you to all who helped make Halloween 2011 much more pleasant than last year. I feel it is a waste of taxpayer dollars to babysit the brats in GB. You have to babysit the brats, their parents refuse to do it. bet if YOU were getting pelted with eggs and shaving cream – or whatever – YOU WOULDN’T THINK IT WAS A WASTE OF MONEY !!! Really? 20 police cars, about 50 police officers for eggs and shaving cream? Yes, a waste of money and resources. Yeah, I’m sure the egg and potato throwing has gotten way out of hand since LA outlawed hand guns in South Central. It is a shame that we needed so many Police in G.B. but I was glad to see them. In prior years I was not comfortable venturing up the Avenue. This year it was totally different. Thanks to all who made it possible. Happy to see all remained calm this year! No screaming parents protecting egg-throwing brats; just children enjoying what Halloween is: dressing up, trick or treating and really enjoying themselves! looks like 20 people don’t know how to use a thumbs up button. what the hell is there not to like about this comment you idiots? I hope that we are on a new beginning. I have a dream where halloween becomes an amazing enjoyable event; with many people participating with costumes in a halloween parade down the Avenue; a costume ball with music, food, dancing and happiness; and people looking forward to making the next years even better and more spectacular. WOW!! I know. I could like that. I think the Police officers and the 61 Precinct command should be commended for Job well done ! It is really a shame that we need police presence to keep the community civil and safe. A job well done to the NYPD & for GB.net for covering the story so well last year. We honestly felt safe walking the streets with our children. As for the negative comments on this site…for some reason there are so many ignorant people that seem to think that crimes, even on Halloween, only happen in this neighborhood. It is mind blowing how small minded many commenters on this site can be. Things happen outside of GB. There is life outside of GB with crime. This is a small area with a high population- it is called high population density. Halloween mischief happens EVERYWHERE. When you have a high population density of children you are going to see an excess amount of mischief on Halloween. It’s sad what happened last year and its commendable to see how the NYPD and property owners handled it this year. It is human growth when one learns from mistakes and correct them. Shame on you for adding such negativity to a joyful event. The cops seemed to have the best time of all. 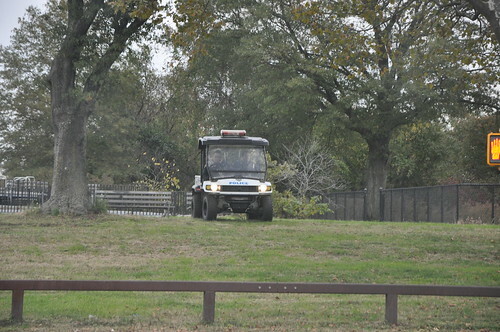 Riding their little coppy golf carts up and down the fields. Refusing to allow grown ups to walk their dogs in the park. It was like marshall law. A ridiculous waste of taxpayer money. I thought the massive police presence was wayyyy over the top. I was so happy to see the police force on the avenue last night, last year the kids were throwing eggs as well as potatoes at cars. My car got hit. If I had my window open, I would have gotten hit in the face. So what did all the trouble makers do? Where did they go, or did their parents actually control them this year? I would love to know if these parents actually stepped up and acted like parents and adults, or just sent these kids to wreak havoc somewhere else. I sincerely hope the parents stepped up. Way to go if you did! Why not just mind your own business? When the actions – or inaction in the case of parents who dont control their children – adversely impacts someone, it absolutely becomes their business! You must be a parent of a trouble maker who refuses to step up and be a parent. When my children are put in danger, it becomes my business and the business of every other parent whose child is put in danger. Instead of wasting your anger on me, put it to where it should be, on yourselves for allowing your children to act the way they do. Do something about it and I won’t have to make any comments! Well all the parents did not step up. One of them was driving down my block, with their window open and talking on a cell phone. The person was saying that the avenue was loaded with police and that they should be very careful. The police, kids, parents, and GB.net should all be commended. force behind a major impovement in GB. See you next Halloween on the Avenue. Very Well Said! If not for this websites coverage of last year, we would have been in the same position this Halloween. I wonder where they went to terrorize people. I know it wasn’t Bed Stuy. I am very happy the police showed up in force this year, and I agree 100% with all who say it’s a shame that so many police were needed to keep the peace. The bottom line is that the parents and kids as well as any passerby were safe, happy and had a great Halloween. If anyone thinks it was a waste of tapayer money, just look at the picture from last year, one police car trying to round up what looks like about 15 or so hoodlums. And most if not all got away. My thanks to the police, parents and GB.net for making this a safe and happy Halloween. I heard there were a few arrest. Any insight on this? 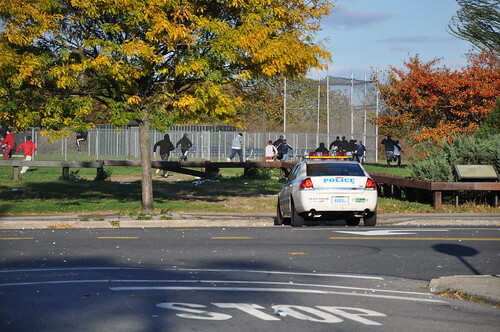 Police kindly asked a few 20 or so year olds to move along on the avenue…the kids thought they were tough guys and kept talking back – they were arrested. What a beautiful, enjoyable halloween! I loved seeing all the children walking on the avenue. That’s how it should be!! Thank you Danny!! I agree! Danny deserves a lot of credit! I heard a few arrest were made. Any insight as to who they are? The same exacts people that are troublemakers. I was grinning ear to ear as I drove down the ave. I Thank You GB.net for bringing to light the few problems that we have down here. If not for you I believe that we would have had a repeat from last year if not worse. It is up to the neighbor hood to take care of its own and by being the “bad guy” you actually were instrumental in creating a good thing. So what your saying is I am the white knight. Essentially I am batman. I accept your offer to make me batman. some people just love to hear themselves talk… wow !! get a life !!! mind your own biz !! WOW.. some people just love to talk trash … mind your own business – REALLY??? your gonna call someone out like that??? you got a lot of nerve !! I agree! NOTHING happened. And STILL these gossips get on here with their nosy questions and snide comments. It’s been a year. You have all bashed the same people over and over again about it. How would any of you like to have every mistake you have ever made as a 14 year old or as a parent constantly replayed for you? Many of these comments come from people whose children are still small. They’ll find out in the future that it is easy to be snide when you kids are small and in a carriage or holding your hand,easy to say, ‘mine would NEVER do this or that’ but like all kids they will grow up and make some bad decisions, make some mistakes. I hope that all of you that have made Renee’s and all these other peoples lives hell this passed year get what you deserve when your kids are teens. What goes around, comes around. You’ll see. These cops are a JOKE!! Get some balls and fight real crime..Flood the SHEEPSHEAD HOUSES with these “cops” and be a real cop…Or are they afraid? Realist. PBBS and BSTF you don’t F with. Calling them afraid? Go join up and get shot at. They fight real crime all the time. We wasted their time with our garbage because we couldn’t handle our own. So I guess many of you were comfortable with the heavy police presence. Yes we should all live in an authoritarian society where all individuality, and especially mischeviousness is stamped out. Hey better yet, invite big brother by.. he can watch all the little kiddies and bad bad teenagers and hypocrites!!! Yeah.. batman take us away!!! And criminal mischief shouldn’t be stamped out because…? I’m with you, Aghast. I am particularly disgusted by the fact that even though it was the dullest, most boring Halloween in the history of the Beach that STILL these people are on here not only gloating about how they have destroyed it for anyone over 10 but gossiping about where some kids were and nosybody ‘wondering’ what steps parents took etc. etc. Keri, shame on you! When will it be enough for you? Batman indeed! We have a great community and a few rotten apples in the bunch. Many thanks to the police department for stepping up and helping us out. It’s true, we don’t have much crime here, but for a few spoiled ones whose parents don’t know how to say “no” to them. Parents please remember we are the first teachers to our children. If we start them out on the right foot, they should stay on the right path. If they stray, hopefully you can reel them back in. We try to do “our” best with them and teach them about morality and treating others as you’d like to be treated. Also, stop giving them money and they’ll get into much less trouble. It was a great Halloween in Gerritsen Beach. I would also commend the person that set up the communication with the PD and MTA and Parks. They all seemed to work together and all went well because of this. Just Want To Say “THANK YOU DANNY”!!!!!!!! its sad that not one person finds it embarrassing that we actually had to have the police here to keep our children in order. Just by seeing that people dislike our posts proves that it is the parents fault not the children’s. they should be ashamed of themselves. now watch how many of them dislike this post! This is the way it has always been and more than likely will always be. Know what they say ignore it and it will go away. But if there were NO police and there were incidents like last year (btw all the cry babies complained about that too!! )…you complainers would be crying about how the police SHOULD have been there.. wah wah wah… however wasteful YOU think it was.. our neighborhood was safe…STOP COMPLAINING AND SAY THANK YOU.. some people are totally ungrateful and have absolutely no manners at all !! you want to thank the police for doing a parents job? why don’t we start calling them up next to change our babies diapers! i got a great idea! maybe we should have the entire 61pct to take our children camping for the weekend. Watch out Gene,They will hit the dislike until your truthful post is gone. There u go… Two cry babies right herefor ya.. I see Ur parents did a great job with u two..Lmao.. Jokes !!! What I don’t get is why it had to be so many cops. Last year there were too few doing too little. People complained that they called 911 and got the run around, ‘call 311′, etc. No response. Then this year we get 20+ police cars, 50 police officers, vans, golf carts, motorcycles, scooters, you name it. They broke out every piece of cop equiptment that they have. It reminds me of Alices Restaurant. I’m sorry, I know that things got way out of hand last year, and the kids had to be chastised and reined in, but there is no way that anyone can justify martial law, not letting 50 year olds back weeds to walk their dogs? That’s insane. Read the article on this post. Batman says there were 20 police cars. One at every intersection for a mile. “probaly” for whose safety? The dogs? LOL. You say first that you walked the whole neighborhood, then you say you drove up and down 6 times. Wow, you were really LOOKING for trouble. Good thing you can count, you sure can’t spell! I pity your children lol lol lol lol lol. When your kids are teens who will protect us from them? The reason why there were so many Police is because people or should I say the People who admit many Parents in the Beach do not care what their Children do or where they are as long as it does not affect them. Therefore the Police are needed to control them This is Truly a black mark on the community.Face it people these are the Facts.Now you can hit the dislike on all the people posting the truth,but the truth still is the truth and will not go away with the click of a mouse. The truth is that we wish YOU would go away with the click of a mouse. For crissakes, you moved to Gods waiting room and yet cannot help waking up there every morning and getting on this website to spew venom and attack the Beach and the people who live here. What is with this obsession you have? No one here cared what you thought when you were here you santimonious snob, why do you think anyone would care now? What are you Talking about ? BTW who are you ? If you had any Guts you would post your name. What does crissakes mean ? Gods waiting Room where might that be ? Santimonious WOW Try Sanctimonious..I see that your ignorance has not faded. BTW one thing you are right about is the Snob part,even with your atrocious spelling. Hi! Kevin,hows it going? BTW sale of my property on Celeste fell through.Still a property owner.Oh Well. See you in approx 2 weeks. Hey Shea how is my friend US Holmes doing ? LOL Great Name real original. I’ll assume that 90% of the negative replies on here are from the beach rats that had to stay home and actually do thier homework on Halloween, and their parents who had to stay home and mind them. Awwwwwww, did I hit a nerve? Losers had to stay home because either you or your friends were not happy or satisfied with just smashing each other with eggs, shaving cream or rocks so you had to be minded by your parents because they could not face the embarrassment that you are a hoodlum or associated with others that could not control themselves from committing crimes against MTA, and others. Take responsibility…Whose fault was this? Don’t beg them! Stand up to them! Is that the “Gay Boy Group” headquarters? No thanks! WTF is GBG headquarters and where is it cause I will be there regularly to teach you a lesson!!! We don’t have to stop you! Your awful education and spelling will stop you. You’ll be dead before your 30th birthday. Have a great short life! You are a Total Idiot ! What exactly does “GBG” stand for & where are the Headquarters??????? You talk tough, but I notice you can’t spell or use punctuation correctly, and your post sounds very much like a threat. If you are their representative, it doesn’t speak well for the whole group. gbg stands for gerritsen beach goons. Would you like to see correct spelling and punctuation? Here it is. GBG will not stand for any of this no more me and my troops will take down anything. GBG!! Whats cracking? You made five mistakes, which proves you are illiterate. 1- gbg representive. Representive should be representative. 3- GBG will not stand for any of this no more me and my troops will take down anything. This is a run on sentence. There should be an exclamation point after the word more to get your point across. 4- “no more” should be replaced with “any more”. 5- me and my troops will take down anything. This is grammatically incorrect. It should read ” My troops and I will take down anything. Your teacher’s must be very disappointed with you! And you, should learn to use spell check !!!!! Goons – quite descriptive. The dictionary defines the word goon as A STUPID PERSON….. enough said! you guys are a bunch of idiots! when the kids run wild and vandalize property you get mad and ask why the police did nothing. Gary; This is exactly what happened. I am surprised that the Dislike Crew has not deleted your Post yet. When they don’t want to hear the Truth or for the most part Believe the Truth,When all else fails keep clicking on Dislike. We really have some very concerned Parents in the Beach..
And when you do nothing GB for life, your reputation will be destroyed and people will see you for the sad little person you are! I think its time for all you People to realize that this is what Happens when a bunch of Punks think they can do what ever they want.The parents of these same Punks don’t seem to care about their neighbors.The Parents are the ones at fault here. After all they created these monsters. Sad to say your right. You invite people to come to your headquarters – but fail to say where it is. Afraid people will show up? I’m so glad the 61st precinct monitors this sight using their Internet Intelligence. I know they have all of these people under survellience just waiting for them to make a move. I, like many of the business owners on the avenue, was glad to see the cops on Halloween keeping the peace. It made it safer for us not to worry about the eggs and rocks thrown at the windows and defacing the businesses. However, imagine my surprise, when I received a phone call from my employee (a long time GB Resident) on Friday night at 10PM!!! telling me that they are throwing aggs and rocks at the windows and when he went to check out what’s happening, he was egged too. He was forced to call the cops because the KIDS (and I use that term loosely) were getting out of control. I usually keep to myself and don’t get into debates on this site, but it is just gettign ridiculous. Since I have gotten a place in GB, I was told time and time again that I don’t have to be worried about adults, but teenagers. Over time, I realized that this is the truth of the GB. Over the period of two years while I was here, I had to put up with quite a few teenagers, who found it necessary to go by the store when the door was open and make fun of my Russian accent, or yelling some insults. I was one of few white kids who gre up in the ghetto in the Bronx, so I have a thick skin, but what happened on Friday just does not make any sense to me. The cops were here on Monday and ruined their chance of egging people and throwing rocks at the stores and busses so they moved their “operation” to Friday??? I wish I could find those “KIDS” and make them wash the windows of the store. Do we need to have cops here every day patroling the neighborhood? Don’t you think it’s ridiculous that it has to come down to 8-10 cop cars to patrol the neighborhood on Halloween to protect us from CHILDREN? I was young once and have done some stupid stuff (we all have), but there was always a line you wouldn’t cross, you would never talk back or assult an elderly or anyone who was older then you are. Now, I find that kids have no respect for age, or anything for that matter. I just find this whole situation very sad. Sorry to say the Beach is a Haven for losers, The parents for the most part care but the few that don’t make it bad for everyone.When you read these posts and the ones that are hidden are many that are true Sad,Very Sad, Now you know why stores are vacant on the avenue. The reason for the Hidden due to etc is that people who will not accept the truth or flat out deny it,seem to have all their friends hit on the dislike so the truth in many cases will just go away. The Blind leading the Blind. This has happened to many of my posts that the ignorant do not wish to believe or read. As Kevin said Sad Very Very Sad. What makes it sad is that almost every day, I get people in the store complaining that there are not enough stores that the neighborhood needs on the avenue. Now I see why there is no good vegetable stand in the neighborhood, or something that will keep the kids busy and out of the streets or any other store that neighborhood really needs. I dont mind the big police presence at all. This year was a breeze and a lot of fun for my family and I. After reading all the comments and bickering among the residents of Gerritsen Beach.I feel the problem is lack of faith in God.All you people need to find Jesus Christ.All of you are blaming each other for this and that,Find Jesus Christ Now.This will put all of you at ease with yourselves. I agree with you. God Bless. So, the answer to all my problems is to find God and bring Jesus into my life. But I can still celebrate pagan holidays. How about I bring The Great Pumkin, The Easter Bunny and Santa into my life too! I’m sure to be blessed three fold! Maybe it was just a lack of faith. That is Exactly what is wrong with youth today.Jesus Saves ! Where in in the bible does it say “jesus will get you”? You make him sound like the bogeyman. You have turned more people away from Christ than you will ever hope to attract. He’s talking about a Mexican. I can not believe that you people are rejecting Jesus..When Jesus lived on the earth (approximately 2,000 years ago), He led a perfect life. He taught by word and example how people should live in love of God and others. Jesus, according to the bible, did not live the perfect life. He lived the everyman life of his time. He was aware of his faults & embraced sinners. Jesus would not be happy with the finger pointers on this site. He told me this himself while he was making fun of TJ. Check your Facts, We cannot fashion our children after our desires, we must have them and love them as God has given them to us. Wow what a great show of force by our local PD, very impressed that it only took kids going after police for it to happen but very happy it did! For you ignorant kids and Parents out there, if your kids did not act like animals then the cops would not be here…Stop blaming everyone else!!! See not my kid does not work when we have pictures of you kid doing wrong. So now for the KIDS on here this is a lesson of responsibility which your parents might not have not taught you, when you behave like savages we will treat you like such! On another note Stop smoking weed in public at 13 years old people see you and your parents will see pics of you. Stop the drugs you have enough problems! Stop breaking beer bottles in the parks we will catch you and expose you to the community. This is your neighborhood Respect It!!!!!!!!!!! Man was made at the end of the week’s work when God was tired.We are never defeated unless we give up on God. Just to follow up on what has been happening around here (including the BLOG). On Friday night at 11PM (yes, ELEVEN PM), bunch of 12-13 year old idiots (I can’t bring myself to call them KIDS), broke a window in MY STORE located on GERRITSEN AVENUE. I have few questions for these so-called children of the neighborhood and their parents. 1 — WHAT THE HELL is your 12 year old doing outside at 11 o’clock at night? 2 — How much do you have to hate your neighborhood to vandalize stores and bus stops along the avenue in your neighborhood? You see, I have been down here for two years. I have come to know alot of good people in this community, even though I don’t live here and wasn’t raised here. I was brought up taught by my parents that you MUST treat everyone with respect no matter who they are or what they do for a living or what their lifestyle is. That is what I am teaching my KIDS even though they are only 3 and 5. In two years I have been here I have donated to every event and fundraiser in the neighborhood. I have donated to teh school even though my kids don’t go there, I have donated to churches, even though I am not a Catholic or Lutheran. I CHOSE to help because these are the things the community has and needs. This is what makes the community stronger. This brings me to a point of kids being born and living in this “SAFE” neighbohood and vandalizing it. They have no respect for someone’s property or age. They will attack a 70 year old woman just for laughs. I don’t blame the kids however, I blame their parents, just like I am sure everyone in their right mind does. These kids wouldn’t have the presence of mind to do what they do unless this is what they are being brought up with. I spent 2 years being respectful and nice to those kids who feel the need to laugh or make fun of me and my being Russian and having an accent. I brushed it off saying “they’re kids”. Well, now it just took another turn. These are not kids, these are hoodlums. Believe me, I know hoodlums, I grew up in the area full of them (East Tremont Avenue and Grand Concourse area in the Bronx). What makes me sad the most is that people who are coming to my store just to tell me that they are pretty sure they know who these kids were, but can’t get involved because they are afraid of retaliation. No offense to the neighborhood, but if you know who it is, why not do something about it??? I said something last year and it went unheard — why not set up a neighborhood watch??? Don’t leave it to the Cops, because 61st Precinct takes 45 minutes to get here when you have rocks thrown in your face. But, having a Patrol Car would be a nice thing to have here. I will be at the next Property Owners Association Meeting, because this has gone far enough. I am fixing my window, which will cost me a nice chunk of change, but something needs to be done to protect the businesses like mine, the laundromat, etc. I am leaving my name, so you know exactly who I am. I apologize for the long post, but this has been boiling inside of me since Friday night. Well looks like it still goes on..Yuri, I am sorry to hear that you are having these problems in our neighborhood. I would think that in this day and age with all the Ethnic diversity there is in NYC stupid and low class acts like this would not occur.I hope your message gets through to the parents of these hoodlums,somehow I don’t believe it will.they will just continue to deny there is a problem.Wish I had an answer but I do not. Despite of everything that happened, I do believe that this neighborhood is full of nice people who care and like this place. I just don’t understand this fear of retaliation from bunch of 12 year olds and their parents. Maybe it’s my personality and the fact that I never back down from a fight, but I don’t understand the whole neighborhood being controlled by 12 year olds. And for anyone who says they are not from this neighborhood, but the outsiders — TRUST ME! They were from this neighborhood. Like I said, I will be at the next POA meeting, and I hope that other business owners on the avenue join me and, hopefully, something will finally GET DONE. Yuri: Here is a quick story that happened approx 15 years ago. My Dad lived in the Beach he was retired and was home quite often. There was this Kid approx 13 or 14 at the time who constantly harassed him and other seniors, I asked around what people think I should do about this and was told don’t mess with this kid he set a few places on fire he is bad news. Well here is what I did one day driving home from work I seen this kid in front of his house,pulled over and dragged his A– around and then explained to him if this happened again I would not be as nice…Conclusion problem solved never happened again,the kid went over to Dads house and apologized. I am not suggesting fire with fire but when you hit the limit emotions take over. Hope your situation gets better. Halloween 2011 was very interesting!